Kelly Packard "is well known for her acting work on Baywatch," the emcee in a tux told everyone within earshot Saturday afternoon as Packard approached the red carpet, just before the debut of a new musical playing for one day only, titled Loving Silent Tears. The musical's publicity materials said it would promote global harmony by bringing "16 countries" together on one stage. It would also celebrate the Supreme Master Ching Hai, Vietnamese-born spiritual leader who has bleached blond hair, owns vegan restaurants, designs clothes and is behind the satellite station Supreme Master Television. "Be Vegan, Make Peace" is her mantra, and 19 years ago the mayor of Honolulu named October 25 "Supreme Master Ching Hai Day." All the lyrics for the musical came from the her book of poetry, Silent Tears. An hour after her red carpet appearance, Packard, as blond as ever and in a shimmery red evening gown, took the stage at the Shrine Auditorium off of USC's campus along with Kristoff St. John. St. John has played Neil Winters on The Young and the Restless since 1991 and won two Emmys. This last detail was made painfully clear by the program and red carpet emcee for Saturday's event, a strange experience -- part ceremony, part revue, part evangelism and always self-promotional, sometimes in a weirdly naïve way. By the time Packard and St. John appeared, audience members in the near-full, 6,300-seat auditorium had already spent about twenty minutes watching a center-stage screen that read "Thank You for Coming" and scrolled through the names of everyone remotely important, from diplomats to media outlets, in attendance (LA Weekly was thanked). They had watched two aerialists fly above the orchestra pit as well, a "special act" not directly related to the musical. St. John said he hoped it didn't take too many good deeds to get to heaven because he's not sure he's done enough, and Packard responded, "You do good things all the time -- you're a vegetarian." "Whoa," said St. John, as if bowled over by the realization. "And so are you." George Chakiris, the pre-show "guest speaker," who played Riff of the Jetts in the Broadway debut of West Side Story and then Bernardo of the Sharks in the 1957 film, continued in this vein. "My personal way to be a hero... is to be a vegetarian," he said, then segued to a recorded greeting from the "inspirational lady herself." A picture of Supreme Master Ching Hai, blond hair piled on top of her head and face lit to look ethereal, came up on the screen and static-filled audio of her voice played. "[T]hough I am not aware of the content of this program in advance, I trust it will be great," she intoned, which seems like the sort of thing someone would only say if afraid people might suspect she planned her own tribute. She signed off with silent video footage of her blowing kisses. Then, finally, the stage went dark to start the show. Directed by Vincent Paterson, who worked with Michael Jackson on his Bad tour, and choreographed by Bonnie Story, who worked on High School Musical (and won an Emmy, as no Loving Silent Tears PR material lets you forget), the show begins with an ensemble number with dancers wearing different cultural costumes. An unsuspecting woman in a pants suit, named Joy (Patti Cohenour) but looking pretty joyless, wanders into the fray. "Everyone has such unusual style," she says. A train conductor (Junior Case, who spent the last three years touring with Cirque de Soleil) senses she needs an enlightening experience, or just to lighten up, and whisks her off on his magic train. The other passenger, a prodigal named Pete, could use some enlightenment too, though for other reasons. First, the conductor takes Pete and Joy to France, then to Jamaica and Korea. In Brazil, Pete picks up a blond girl in a skin-tight dress, and, since the next stop is New York, his problems have only just begun. In New York, Broadway marquees flash in the background. 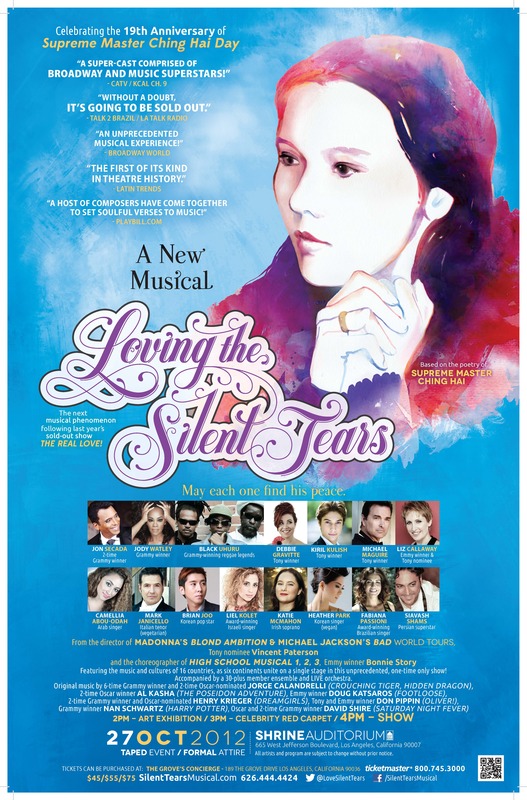 There's one for The Lion King, Phantom of the Opera and Mary Poppins, but most prominent of all is the marquee for Loving Silent Tears, a portrait of Ching Hai as a young woman above looping cursive letters. Dancers in monochrome suits hold up headlines and sing the lines: "But as the world is full of troubles/I find no place for You!" Her supporters run vegan restaurants all over California, like Vegan Tokyo Teriyaki on Figueroa, Vegan Bistro in Whittier or the famous Loving Hut in the Bay. They have also put on productions like this before, often in commemoration of birthdays or anniversary. Last year, another one-day-only musical, The Real Love, premiered in celebration of Supreme Master TV's 5th anniversary. Loving Silent Tears proceeds in a way you might expect: some hoodlums board the train in New York, Pete violates precept 3, 4 and 5 -- stealing, drinking and fooling around. Eventually, Joy and Pete open up to each other and have new leases on life by the time they reach Vietnam. At the end of the show, the whole cast comes onstage. "Let's take each other's/Take each other's hand," they sing. Audience members had been given star-shaped light up wands to wave, too, though quite a few had stopped working properly by this point in the show. The idea, lurking behind this song and dance number and each preceding one, that audiences can be made inner-peace-hungry by osmosis, especially if there are minor celebrities around to fuel the hunger. Once the show finished, if you had a VIP pass, you were ushered through the art exhibition of Ching Hai's paintings, jewelry and couture (including vegan fur), into a banquet hall. There, a vegan feast had been laid out. If you had no VIP pass, you were met outside by genial people in aprons that read "Supreme Master" and encouraged to come into big tents to eat vegan dishes potluck-style.